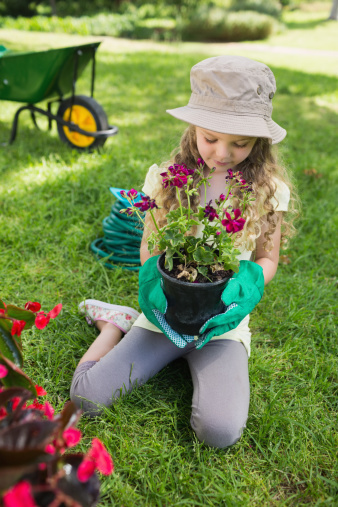 Love having a green lawn, full of colorful flowers, herbs and shrubs, but don’t have the time or money to keep it looking its best all year? Use these simple tips and everyone will be green with envy at your green lawn and full wallet. Then store you gardening tools, supplies and plants conveniently back in your Cook Portable Warehouse. 1) When replacing potted plants each season, fill a hole with an empty plastic pot. Then when you are ready for a change, the plants can be easily switched out. Or cut holes in the bottom and use a large, inexpensive Rubbermaid storage container as a readymade mini-garden for a patio or deck. 2) Use packing peanuts at the bottom of large flower pots. They are less expensive than soil and help with drainage. Remember to add a layer of landscape fabric between the packing peanuts and the soil. 3) Think about planting seedlings in the rind of a grapefruit, lemon or other citrus fruit or in empty eggshells. Both are free and will compost the soil. Just remember to cut a hole in the bottom of the fruit for drainage. Another option is to reuse the plastic containers that six-packs of flowers come in or empty yogurt cups for seedlings. 4) Many items you would probably find in your kitchen cabinet or trash bin can help the growth and development of your plants! Milk works as a fertilizer and anti-fungal agent for plants. The water you cook starches, vegetables and eggs in also has important nutrients, just wait for it to cool down first! Banana peels have potassium and phosphorus that helps prevent disease in roses. Flatten the peel and bury it under 1 inch of soil at the base of a rose bush. Grind up eggshells to make it easier for your garden to absorb calcium or add coffee grounds to the soil of azaleas. Soak seeds in chamomile tea to help germinate and prevent fungus. 5) Some fruits and vegetables can be regrown from parts that would typically be thrown away. Replant a pineapple by removing the top leaves, putting it upside down to dry for 1 week, placing it in water for several days to allow roots to sprout and then plant it.If you’re more of a veggie lover, place the white bulbs of a green onion in water and it will regrow. 6) Epsom salt has magnesium and sulfate, which are critical to plant life. For potted plants, mix 2 tablespoons of salt per 1 gallon of water once a month or sprinkle into your garden’s soil twice a month to help seeds germinate. 7) Pinch the tops of your herb plant stems off to encourage new leaf growth. When herbs are pinched, they send a signal to the dormant leaf buds to grow. So you will get more delicious seasonings for cooking! 8) Collect rainwater and use it to keep your plants and lawn hydrated. Grab a heavy duty trash can, cut a hole in the top and secure to your gutter spout. 9) Make a homemade weed killer with 1 gallon of white vinegar, 1 cup of table salt and 1 tbsp. of liquid dish soap. Use only on concrete and pavement because it could also harm grass and flowers. Learn more about the storage options a portable shed provides for all your gardening tools and planting materials. 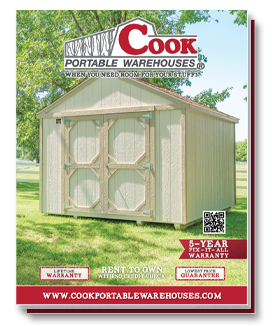 Check out our free Location Guide below to see where a Cook Portable Warehouse would best fit in your yard!